Snacks are an important thing to be included in our meal plans, especially if you are thinking of eating healthy. It's a great thing to add them in between your meals. It's important that we know the healthy snacks as most people tend to snack on things that are energy-dense and high in calories. So when they think they've had a snack, they would actually have had another meal, no wonder why they then gain weight. The same applies to our kids. If we want our kids to avoid childhood obesity and the dangers of childhood obesity we need to know the healthy snack recipes for kids. Readily available, easy things like popcorn, fruits (fresh or dried), biltong, nuts and vegetables are good snack ideas for kids. Here are three of the healthy snack recipes for kids you can prepare. Peanut butter is a nutritious spread, as we know it's made from nuts and we know that nuts are a good source of protein and iron. This is why it's in the healthy snack recipes for kids classification. If your child is allergic to nuts you can substitute the peanut butter with oats. Grease about 2 baking sheets and preheat your oven to 180 degrees Celsius. In a bowl, put your butter, sugar and essence and using either a wooden spoon, hand-mixer or electric mixer, mix together the ingredients until light, fluffy and creamy. Add the egg gradually and beat well. Add in the peanut butter. Sift the dry ingredients together, add to the mixture and blend. Shape into a ball, cover and chill for an hour. Roll spoonfuls of the mixture into walnut-sized balls and arrange on the greased baking trays, allowing room for them to spread. Flatten slightly with a fork. Bake for 10-15 minutes or until golden brown. Allow to cool briefly on the baking sheets before transferring to a wire rack to cool completely. Your child can have 3 of these bickies with a cup of water and a mini-fruit salad (half a cup) as a snack. Healthy snack recipes for kids are just about easy to come up with. The benefits of this recipe are that it contains yogurt and raspberries. Yogurt is a great dairy product. It has active cultures which help boost the immune system and promote a healthy digestive tract. We will learn more about the benefits of eating raspberries further down the article. Frozen raspberries make the smoothie thick and cold. 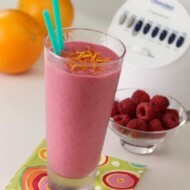 You may get more smoothie ideas in the article healthy smoothie recipes. Combine the raspberries, yogurt and milk in a blender or food processor. Blend on high speed for 1 minute or until smooth. Pour into serving glasses. This recipe can make 3 servings. Corn fritters are one of the delicious healthy snack recipes for kids. Corn is a rich source of vitamins A, B, E and many minerals. It's also high fiber which means that it plays a role in prevention of digestive ailments like constipation. Corn also helps in controlling diabetes, prevention of heart ailments and lowering hypertension. So you see why this is included in the healthy snack recipes for kids? Sift flour into a bowl, add the corn and cheese and stir until well mixed. Make a hole in the center and pour eggs into the hole. Stir until just mixed and then divide into six equal portions. Melt half the butter in the frying pan. Add three portions of mixture to pan, about 3 cm apart, giving each fritter room. Cook fritters over medium heat for about 3 minutes or until the underside is golden. Turn fritters over with an egg slice and cook the other side for 3 minutes also or until golden brown. Remove from the pan; drain on paper towel and keep warm. Repeat with the rest of the butter and mixture. This recipe makes 6 fritters and your child can have 2 with a glass of fruit juice as a snack. Kids enjoy cooking and helping you out in the kitchen. I have two of my own and the way their faces light up when we cook together is enjoyable to see. It's a great way to spend time together as well as getting them to know about food and nutrition and how important it is to eat healthy. There are plenty of quick, easy and fun healthy snack recipes for kids to make and here are just two of them. Place the ice cubes in a blender or food processor bowl. Process until the ice is roughly chopped. Add the chopped mango. Process until fruit and ice are well combined. Pour mixture into a tall glass and serve immediately. The mango wizz can be enjoyed together with some dried fruit and raisins. Garlic is good in lowering blood cholesterol levels. It is also used to help lower high blood pressure. It's good to include your garlic in your meals, it fights a lot of things and does great service to your body. This is why it's included in the healthy snack recipes for kids category. Cut torpedo rolls or French sticks in half vertically. Mix butter, basil and garlic in a bowl. Grill uncut side of the rolls for 1 minute or until brown. Spread cut side with butter mixture and grill for another minute or until brown. 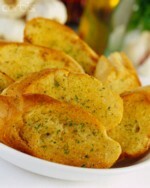 The crispy herbie-garlic bread can be eaten with a glass of milk and some fruit wedges. Popsicles are a healthier option to ice-cream. They can be a nice treat and a healthy snack as long they are made from 100 percent real fruit juice and contains no added sugars. They contain all the healthy benefits of real fruit juice. This is why they are classified in the fun quick easy healthy snack recipes for kids. Not that you can't treat your kids with some ice-cream, we all do, but with controls! half a cup frozen or fresh fruit such as blueberries, mangoes, raspberries or peaches. one quarter of vanilla whole milk yogurt. 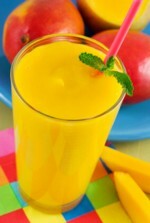 half a cup frozen 100% fruit juice concentrate such as orange, grape, pineapple or raspberry. Mix up yogurt with a spoon until smooth. Pour into a strainer lined with a white paper towel, and set over a small bowl. Keep in the refrigerator until most of the liquid from the yogurt drains out. That will be about 3 hours or you can do it overnight. Toss in a handful of the fruit you are using, half a cup of fruit juice concentrate and puree the mixture in a blender or a food processor. Using a spoon, fill the ice pop molds, alternating with the fruit and yogurt. Tap mold on the counter to displace any air bubbles. Insert the Popsicle sticks and freeze overnight or for about 6 hours. When ready, run molds under warm water for about 10 seconds and gently, slowly pull them out. Serve immediately or wrap in plastic wrap and refreeze. It's a great idea to cut up your child's bread into different shapes such as triangle, square, circle, rectangle... the sky is the limit really, seeing as there are many shapes, let your imagination take you there, use cookie cutters. Your kids will be fascinated and will gladly eat it. They can even help in the actually making of the bread. There are plenty of delicious, nutritious healthy bread recipes that you can try out together. Shred the chicken pieces into smaller, bit-size pieces. Mix together the chicken breasts, salt, pepper, onion and mayonnaise until well combined. Put in cling wrap paper or foil wrap to maintain freshness before putting the sandwich into your child's lunch box. There are plenty of other healthy fillings you can put on your sandwiches such as lettuce and cheese, avocado and bits of bacon, tuna (canned fish), peanut butter and jelly, the list goes on. You can also put energy bars in addition to the packed lunch, biltong and some of the examples we've mentioned earlier in the article. There are plenty of reasons as to why this recipe passes into the healthy snack recipes for kids. One is that they are delicious and kids love them. The second raspberries contain what are known as anthocyanins which act as powerful antioxidants that protect cells from damage. Antioxidants are also linked with keeping our hearts healthy. Blueberries also contain anthocyanins and may help reduce the risk the risk of cancer, heart disease and stroke. Some studies have shown that eating more blueberries is linked with healthy aging and improved memory function. So be rest assured that you're giving your child a pack load of nutrients from these muffins. These will take just 25 minutes cooking time and 15 minutes preparation time. Preheat oven to 190 degrees Celsius. Place your muffin cups in 80ml capacity muffin pans or grease the muffin pans if you're not using muffin cups. Combine the sugar and flour in a large bowl. Add the raspberries and blueberries and stir until just combined. Add the egg, buttermilk and oil and stir until just combined, make sure you don't over mix. Spoon the batter into prepared muffin pans and bake for 25minutes or until a skewer inserted in the middle comes out clean. Turn onto a wire rack to cool. Can be served warm or at room temperature. Store muffins in an airtight container. They can even be made a day ahead. You can be guaranteed that these healthy snack recipes for kids will be a treat for the kids and enjoyable for both you and them to prepare.